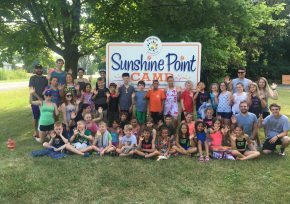 KIWANIS SUNSHINE POINT CAMP (KSPC) sits on seven acres of land on the shores of Lake Erie in Harrow. 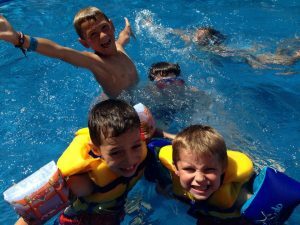 Kiwanis Sunshine Point Camp is a 5-night, 6-day, overnight camp for children offered for seven weeks over the summer. It is located on Lake Erie at 955 County Road 50 East, 45 minutes from Windsor, between Colchester and Kingsville. We offer residential camps for girls and boys between the ages of 7 and 14 years, and can accommodate 60 children each week. All children stay in cabins where they can build lifelong friendships with other campers. Our six cabins, which will be all new for 2018, offer bunk beds for a good nights sleep and each cabin has a counsellor assigned to keep our campers safe and secure. We have extensive facilities including a kitchen/dining hall, large washrooms with showers and a large in-ground pool with a certified lifeguard. KSPC has been the major project of the Kiwanis Club of Windsor for 65 years. 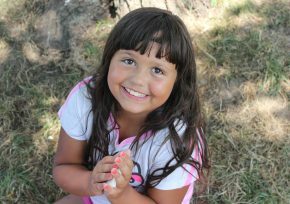 The camp offers a fun, safe and enriching experience for the children of Windsor & Essex County. Financial assistance is available to ensure all those who want to attend our able to. GREAT NEWS! We are proud to receive an Ontario Trillium Foundation grant for 2018 allowing us to build a new playground and a new picnic and crafts pavilion. 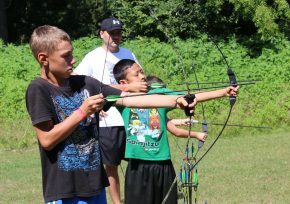 Camp programs include swimming, soccer, arts and crafts, archery, campfires, sing-a-longs, games and more!